Please read all T&Cs before ordering. 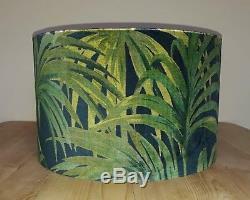 Made to order 40cm drum lampshade created using HOUSE OF HACKNEY'Palmeral' velvet green / midnight fabric. PLEASE STATE WHETHER TABLE OR PENDANT FITTING REQUIRED AT CHECKOUT. Lampshade shown is for illustration only. Also big enough for a standard lamp. Luxury British velvet featuring an explosion of palm leaves. PALMERAL is an Art Deco-inspired patio print that is reminiscent of 1930s Palm Springs and pays homage to Loddiges, one of the worlds largest palm houses based in Hackney during the Georgian period. Once a Mecca for tropical plants, it was the original inspiration for many of the species at Kew Gardens today. 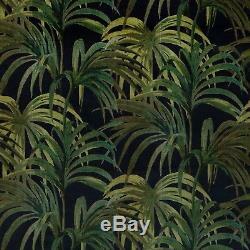 Bring the outdoors into your home with this fresh foliage print in Midnight / Green colourway. Fit the standard bayonet cap (BC) lamp holder. It can also be used with Edison Screw (E27) lamp holders, most common in Europe, simply remove the converter plug in the centre of the fitting. Low energy bulbs must be used with your lampshade. They use less energy and are cool to the touch, avoiding the problems or scorching shades and ceilings. S are available in my other items. If you can't find what you're looking for please. Please note that due to pattern size and by the nature of these being handmade, no two will be identical. I will always ensure that there is a good pattern placement. Other items are available in my listings in different shapes, sizes and styles, using other designer fabrics. I make most types of soft furnishings including curtains and blinds so please contact me via messages if you would like to commission a custom item to be listed. Please note that the branded fabric is used in the creation of this item. These are not endorsed by the brand, neither are they branded as such. These are handmade items using the branded fabric only. Please note - all products are made to order, which means no two will be identical. This also means that they take longer to arrive than mass produced items so please bear this in mind when ordering. It also means that your item will be unique, made especially for you and made to higher stand than many off-the-shelf products. I have many years experience in making soft furnishings and take pride in every single item I make so you can be assured that the product you receive will be of the very best quality. Please note that all orders are handmade and at particularly busy times, may take longer to complete. Please note that I always endeavour to deliver products earlier than advertised but this is not always the case in particularly busy periods or the odd occasion when fabric takes longer to arrive in stock. All lampshade orders are tracked within the UK with tracking details available to you in your. Order cancellations, however, will not be accepted. In the event of damage during transit, replacements only will be issued on receipt of clear photographs of damage to both the item and the packaging. 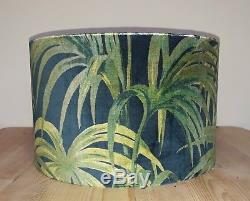 The item "House of Hackney Palmeral midnight / green velvet 40cm drum lampshade" is in sale since Monday, March 12, 2018. This item is in the category "Home, Furniture & DIY\Lighting\Lampshades & Lightshades". The seller is "loulouthomas" and is located in Wellington. This item can be shipped to United Kingdom, Austria, Belgium, Bulgaria, Croatia, Cyprus, Czech republic, Denmark, Estonia, Finland, France, Germany, Greece, Hungary, Ireland, Italy, Latvia, Lithuania, Luxembourg, Malta, Netherlands, Poland, Portugal, Romania, Slovakia, Slovenia, Spain, Sweden, Australia, United States, Russian federation, Canada, Brazil, Japan, New Zealand, China, Israel, Hong Kong, Norway, Indonesia, Malaysia, Mexico, Singapore, South Korea, Switzerland, Taiwan, Thailand, Chile.